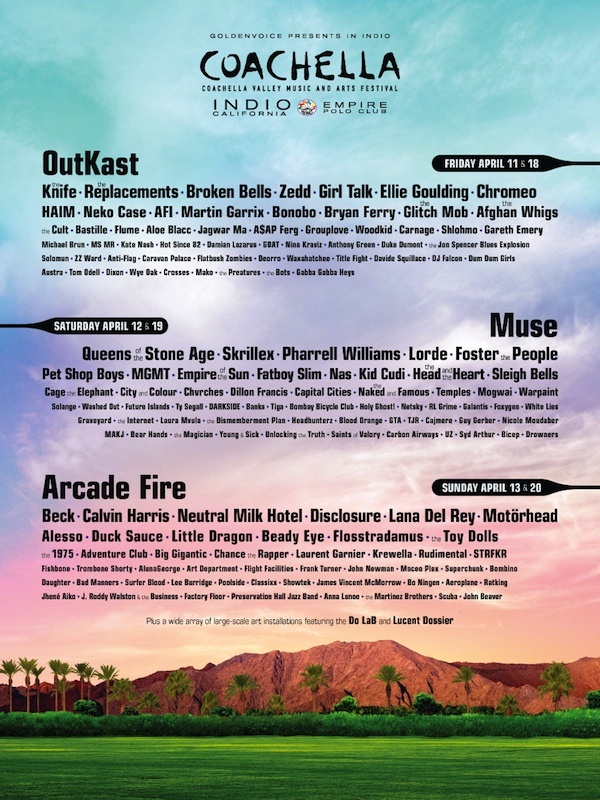 Coachella >> 2014's lineup was officially announced this week and to no surprise this lineup is as solid as ever. While there's tons of artists taking part that I've experienced before and I know will have strong performances, there are quite a bit I'm looking forward to seeing for the very first time. Barring any godforsaken schedule conflicts between stages, here's a lineup of artists I look forward to seeing at Coachella this April and knocking off my bucket list. This entry was posted in festival, music, rando, shows and tagged alesso, broken bells, california, chvrches, coachella, crosses, dj falcon, ellie goulding, fatboy slim, festival, flosstradamus, glitch mob, haim, indio, lana del rey, little dragon, lorde, nas, outkast, pet shop boys, the internet, the knife, tiga, warpaint, white lies. Bookmark the permalink.